A very unique poster exhibition that has been touring the world has recently wrapped up a great show in Montevideo, Uruguay. 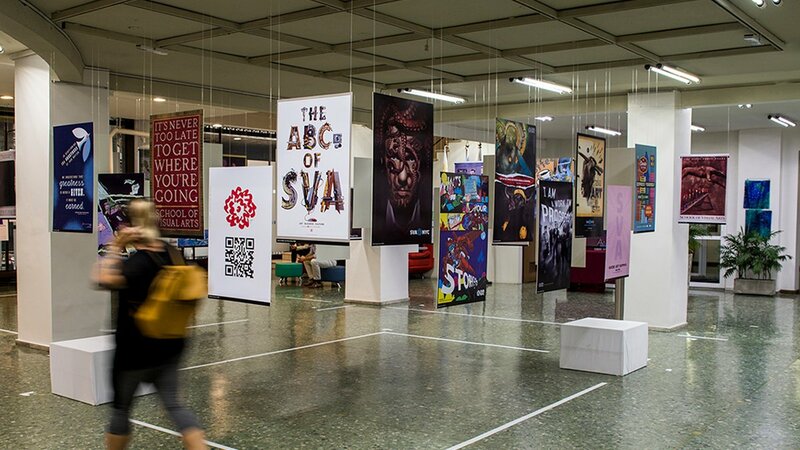 Underground Images brings together the work of some of the world’s best designers, created at SVA for display in the New York City subway system. SVA has been using alternative marketing strategies since the mid-1950’s to attract new students and took advantage of the New York subway system to showcase powerful and thought-provoking posters. Over the years designers such as Ivan Chermayeff, Milton Glaser and George Tscherny have featured their posters as part of this campaign. Recently, a collection of these amazing posters arrived in Uruguay and was shown at Universidad ORT—Uruguay’s largest private university. This travelling exhibition includes many great posters that have been carefully selected and curated for locations around the world. The interesting display in Uruguay had posters hung from the ceiling of the facility using wire at different heights. The 34 artists in “Underground Images” include Gail Anderson, Marshall Arisman, Chris Buzelli, Gene Case, Ivan Chermayeff, Paul Davis, Pablo Delcan, Sal De Vito, Stephen Doyle, Louise Fili, Audrey Flack, Nathan Fox, Bob Gill, Robert Giusti, Milton Glaser, Phil Hays, Steven Heller, Mirko Ilić, Viktor Koen, Stephen Kroninger, Marvin Mattelson, Clay Patrick McBride, James McMullan, Jerry Moriarty, Tony Palladino, Edel Rodriguez, Julia Rothman, Stefan Sagmeister, David Sandlin, Paula Scher, Yuko Shimizu, Eve Sonneman, George Tscherny, James Victore and Robert Weaver. For more information and to view photos from this great exhibition click here.